OSIRIS-REx, envisioned approaching 1999 RQ36 (Credits: NASA). 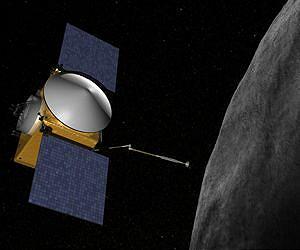 NASA’s OSIRIS-REx spacecraft, due to launch in 2016, has a primary mission of sampling the potentially hazardous asteroid 1999 RQ36. But along the way, OSIRIS-REx is going to investigate some other useful maneuvers, such as how to land on an asteroid, and most importantly, how to predict when an asteroid poses a collision hazard. OSIRIS-REx will aim to improve collision predictions by collecting data on the Yarkovsky effect, a slight trajectory shift that results from an asteroid reemitting solar radiation energy. Although the Yarkovsky effect is small, frequent exposure to the sun means the effect adds up over time – creating big inaccuracies in collision predictions. This mission will try to make the most precise measurement of the Yarkovsky effect to-date. “We expect OSIRIS-REx will enable us to make an estimate of the Yarkovsky force on RQ36 at least twice as precise as what’s available now,” says NASA’s OSIRIS-REx scientist Jason Dworkin. This estimate will feed into more precise asteroid models, so when the big one comes, we get plenty of warning. I was excited to view the film; but there is no “video below”! That’s not good! Sorry about that, Paul, it looks like the video went vamoose. I added a new one – see what you think.